What's not to love about a pop-up? ... and I don't mean an expandable camper, either. As a marketer, I've long adored the concept of the pop-up. It's a temporary, branded physical presence (e.g., store or lounge) available for a limited time only, from one night to a month or two. Some pop-ups are open to the public, some are open to select invitees, and the really smart ones run a combination. You can sample drinks or food, play new games, get your hair done, buy yourself goodies, have a gourmet meal ... the sky's the limit. they have great freebies for people like us to try - and to spread the word! I've been to a slew of pop-ups, checking out new products, sipping whiskey, playing pool incompetently, gawking over amazing art and design, fussing over hair blow-outs and enjoying fly-by-night dining. It never gets old (see first point above - squirrel!). 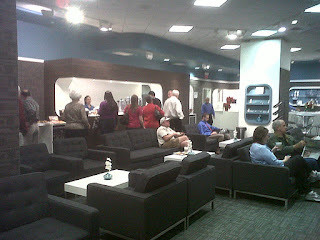 Today, Greg and I experienced the United/Continental VIP Lounge in the Galleria mall, located near Nordstrom. 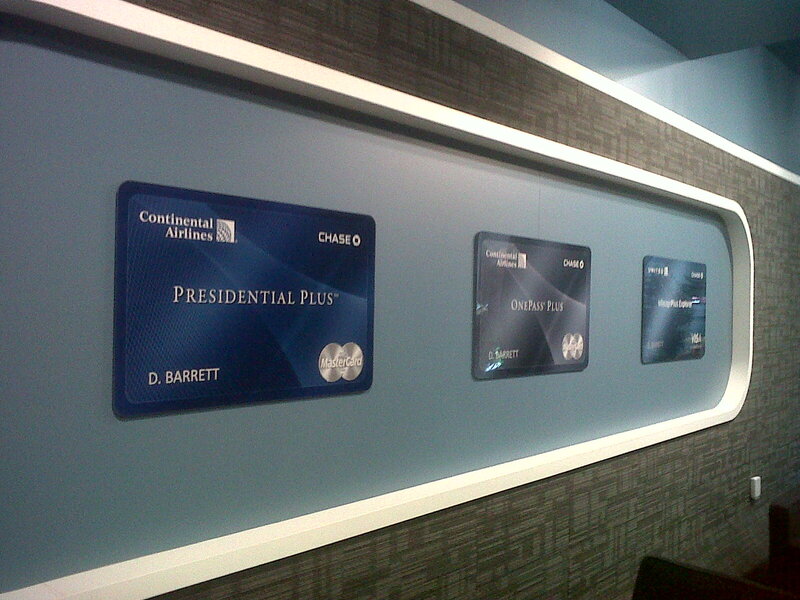 Show your Continental Chase Presidential Plus or Chase United airline affinity credit card, and you're in. 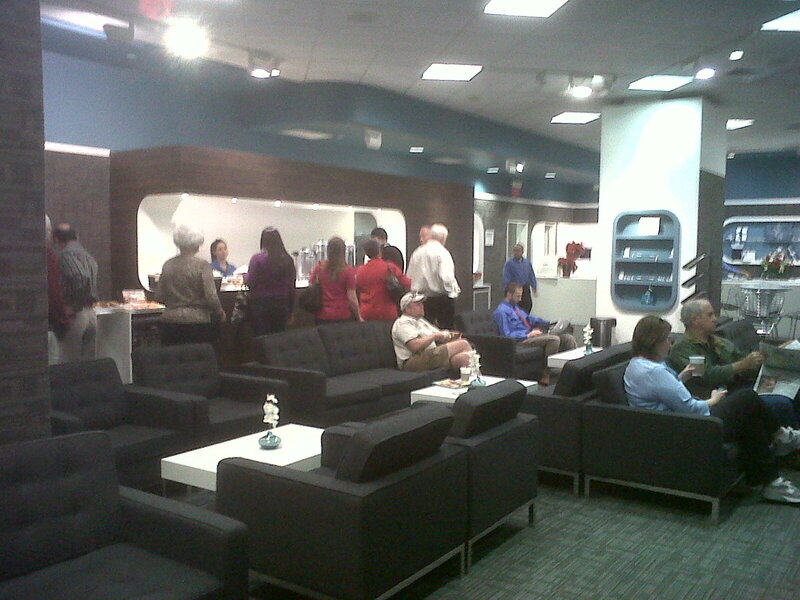 Hand over a new unwrapped toy, and you get two United Club passes, free! How cool is that? We felt like VIPs and were excited about helping Toys for Tots. Have you had a cool pop-up experience? How did it make you feel? Every relationship (spouse, family, friends, pets, etc.) 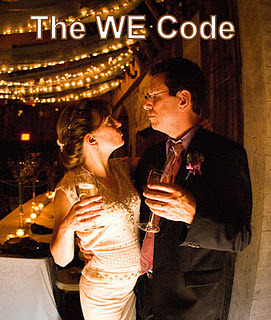 has a "WE" code even if you are not aware that one exists. It is very important to understand the nuances of the "WE" code in order to remain calm and happy whenever the code is invoked. Everyone you will encounter has their own "WE" code and their own unique interpretation of exactly what is expected once it is dropped on you. "WE need to go to Sam's Club and pick up a few things." "WE need to make dinner." "WE need to go to Marshall's & TJ Maxx." "WE need to go to the gym." "WE need to grill tonight." "WE need to go to Home Depot." "WE need to do laundry." "WE need to iron the clothing." "WE need to make the bed." "WE need to power-wash the deck." "WE need to drive to upstate NY for Christmas." "WE need to exercise/walk more." "WE need to eat less wings." "WE need to fill-up/wash the car." "WE need to quit playing Fantasy Football." "WE need to pay the bills." "WE need to get the oven repaired." "WE need to clean the house." These codes should not be taken lightly nor for granted. Misinterpreting "WE" codes has been proven to cause moderate to extreme pain in the lower extremities, just above the hamstrings. When in doubt, always assume the comment was directed at you exclusively. When returning a code always assume the comment you are making is in reference to you exclusively. If you are having trouble identifying any WE=WE codes, assume that all those possibilities apply to you exclusively. If a third-party in a WE = HIM or HER or THEM is hard to discern, assume that it applies to you exclusively. Many of us have that leftover turkey in the fridge. And while 82% of us promise to make soup out of the remains of the bird, probably only 23% of us actually carry out this plan. Here's a secret from a foodie: I never cooked a turkey myself until this year. Yep, with all the cooking I do, you'd think I'd be expert in the art of the bird, but no. I'm conditioned by the squeaky, snapping noise created from opening the package of neatly trimmed chicken breasts, arranged in a row like soldiers. 1. Put turkey, chicken broth, 1 onion (quartered), 1 carrot (cut into about 4 pieces), 1 celery stalk (cut into about 4 pieces), and 1 bay leaf in a large stock pot. Bring to a boil, then simmer about 1 1/2 hours. 2. Remove all the turkey bones and big chunks of veggies from the pot. Now, strain what's in there over a big sieve set on top of a big bowl. Chuck out the contents of the sieve. Notice the rich smell and nice color. 3. Wipe out the stock pot with a paper towel. Heat olive oil over medium-low heat, then add the garlic cloves, 1 onion (diced), 1 carrot (diced), and 1 stalk celery (diced). Sweat until softened (7 or 8 minutes). 4. Add sage or Bell's seasoning, 1 bay leaf, parsley, turkey meat and that yummy broth. Stir in wild rice, and simmer for about an hour (wild rice takes a while to cook through). 5. Revel in the praise you'll get for your awesome re-purposed leftovers. Makes a whole lot of servings - enough for freezing. Greetings and welcome to our new blog. 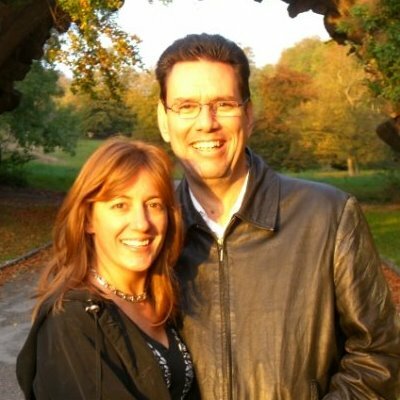 Brooke and I have discussed doing a blog for about 2 years now, but we have always seemed too busy to take the time to share some of our experiences about food, including our personal restaurant reviews and Brooke's tips for creating healthy, delicious, and affordable meals at home (look for recipes, too). We also hope to provide useful information on travel, even for the budget minded. Lastly, we will offer suggestions on how to take advantage of local events (not just for Houston, TX), with little or no cost to you while simultaneously enhancing your social and business networking opportunities. Along this journey we hope that you will see and understand the value that true love plays in making everything we discuss both healthier and happier. This is not meant to include only husbands and wives or boyfriends and girlfriends, but anyone who shares life moments with someone that they truly love. There is no greater satisfaction in life than enjoying quality experiences with loved ones. So this is the beginning of an experience that we both see as an adventure and as a personal catharsis from the demands of our every day lives. We hope to approach this as a sort of modern day Burns & Allen with both levity and whimsy (Note: if you are under 40, you may not have heard of George Burns and Gracie Allen - Google it!). We look forward to your ideas and suggestions on specific topics and we will be inviting guest bloggers to contribute their ideas, of mutual interest, in the very near future. We now ask you to sit back, relax and enjoy the blog. "Say goodnight Brooke..."